Also Recommended: Soredemo Machi wa Mawatteiru, Gintama, Sayonara Zetsubou-Sensei. Notes: Originally a manga by Hikaru Nakamura. This is the continued adventures of the new recruit, Kou, and his 'girlfriend' Nino, a girl claiming to be from Venus, and the other Arakawa riverside misfits such as a musician with a star mask, a transvestite ex-soldier who dresses as a nun and the mayor who claims to be a kappa. Reviewing a sequel seems strange to me, especially at this point, where it has run its course and all we western fans have left to do is wait for a licensing agreement. 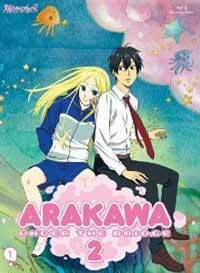 NIS America licensed season one of Arakawa and I can only hope that they extend the same courtesy to its sequel, Arakawa ~ Under the Bridge x Bridge, because it is in fact better than its incredibly hit and miss predecessor. It finds a groove, a wave, that the first season didn't seem to have and it rides it hard and well. It's odd but Studio SHAFT comedies are forming a habit of this; Zoku Sayonara Zetsubou-sensei is better than its predecessor is and Hidamari Sketch is somehow getting better every coming season. In fact, Arakawa x2 is a good name because it is more of everything the first season gave you: more craziness, more odd romance and much more good comedy. The funny thing is that I say this as a fan of the first season, I don't want to talk it down despite it being pretty slight compared to SZ-S, Hidamari or even Soredemo Machi wa Mawatteiru, but season 2 really raises its game and the show finds a niche in which it is comfortable to entertain. I liked the first season of Arakawa because it was a game to me. Every time the show moved to set up a gag, I would get my brain turning to try to pre-empt the punch line before it arrived in its inevitably bizarre glory. It was fun and it was hard, at least to begin with, but once I started to get the pattern - started to figure out the writer's turn of thought - then the series settled into a pleasant mediocrity. It was nowhere near bad or boring, the characters were certainly pleasant enough if I ignore Maria, but the excitement was gone and the madness became routine. I would not have enjoyed another season of that. As I said, thankfully I never had to. Dynamics change this time round in a way that alters the core thrust and direction of the show - it stops being a show that constantly tries to surprise like the lateral thinking man's joke book but integrates its characters into a well-oiled gag-making machine. The key difference to me is how the character of Kou fits into the Riverside. Quite naturally, in the beginning, he was an outsider looking in. He was the Riverside's straight man, always ready to call out everyone on their complete lack of common sense whenever the opportunity arose (and it did often). Kou, however, is now very much part of the Riverside and it suits him better. Star has also positioned himself into a more flattering position. He is still Kou's love rival but he is also pretty much Kou's best friend now and is now portrayed as relatively normal (as normal as Kou anyway, who never was) and even shares the straight man duties on occasion when things take a left at Cloud Cuckoo Land. The best thing is probably that Kou and Star are not staunchly normal. They run with the bizarre and the silly with no restraint at all and that allows the show to be light-hearted and fun without the anchor of trying to show the series through so-called 'normal eyes'. The first season treated the characters as jokes as and of themselves but Arakawa x2 broadens its horizons and lets those crazy characters do what they do best. The gags become more about the situation rather than the characters that are in them, lengthening out the first season's rhythmic pace and allowing for some comic key changes. Another thing that makes this series so enjoyable is the advancement of Nino and Kou's relationship. I have to admit that it took me by surprise, going by the first season's standards; I assumed that the show would treat the relationship the characters have as boyfriend and girlfriend as almost a 'hands-off' matter. Shows like this have a habit of keeping relationships of almost any kind as concrete, immovable objects that exist purely to deliver comedy. Once that relationship is established, it is a dynamic that will never change lest the 'magic' is lost. Arakawa does not care about that and weaves its utter zaniness with its touching plot progression. Kou and Nino are a funny couple. Their naivety (though completely mismatched) makes them incorrigibly cute, the way Nino punches Kou when she is really happy is one of those odd, little, charming details that makes you laugh and makes you smile, all warm inside, both at the same time. The drama pushes to the point of absurdity but it never feels cheapened by it. The characters are deep enough, empathetic enough, that they cannot help but be both adorable and hilarious at the same time. Not all is green in the valley however; many of the flaws that existed in the first season remain. Maria is still a very unpleasant character and even with advancements in the humour, the show is still hit and miss - just less so. The move towards longer, more situational, gags is a two-edged sword - where you get moments of genius like the isolation training but then have moments of narrowed-eyed confusion such as the fight between the twins. That said, the show looks better than ever (not the meteoric budget rise of the latter seasons of Hidamari Sketch but definitely a sharper, more colourful look). The music, also, remains as pleasing and appropriate as the first season (Etsuko Yakushimaru's OP, COSMOS vs ALIEN, is as much a pleasure as her work on season one's OP, Venus to Jesus). Ultimately, I don't think Arakawa x2 will ever threaten SHAFT's best work. It still lacks the comic adventure of SoreMachi, the vicious cleverness of SZ-S or the sheer, overwhelming joy of Hidamari Sketch (and that's leaving aside the studio's more narrative work) but Arakawa ~ Under the Bridge x Bridge is still very funny and well worth your time. If you want your comedy to be a bit on the zany side and, just occasionally, on the softer side too then make this a show to see. Recommended Audience: Nothing particularly objectionable but the humour aims more for teenagers and up so they will be the ones most interested in this. There is also a little blood used for comic effect.